← What Counts as Academic Dishonesty? I kicked off Spring semester with some discussion questions meant to work as icebreakers. Two of the prompts are fairly typical: one asks students to talk about an object significant to their careers, and the other asks students to brainstorm characteristics of technical writing based on their experience and observations. your major and career goal (i.e., what do you want to be when you graduate?). what one thing people in your career can do right now* to stop the zombies. how that one thing will be effective. I’m delighted to report that the Zombies Discussion has been the most popular by far. Even more significant to me, students’ responses are showing a wonderful level of creative and analytical thinking. For instance, one computer science major suggested creating programs that analyze live video streams, comparing appearance and movements to what zombies look like and the ways that zombies walk in order to determine when zombies are near. Not a bad solution, I think. Even better, however, were the replies . One student asked how the program would tell the difference between zombies and people in zombie costumes. Another wondered how the program would differentiate between zombies and people with mobility issues, like senior citizens or people with injuries or disabilities. Other students have talked about military drone strikes, protecting information systems, security of the water supply, crowdsourcing reports of outbreaks, social media survivor networks, cures and vaccinations, DNA modification, landscape barriers, and more. There are so many options—and a good bit of fun to be had. I swear I would try this next term if we had a way to advertise a special focus section of technical writing on my campus. Who knew that an icebreaker would be so inspiring? What kinds of icebreakers do you use? More importantly, are there zombies in your writing classroom? Leave me a comment below to tell me about your classes. I’d love to hear from you. 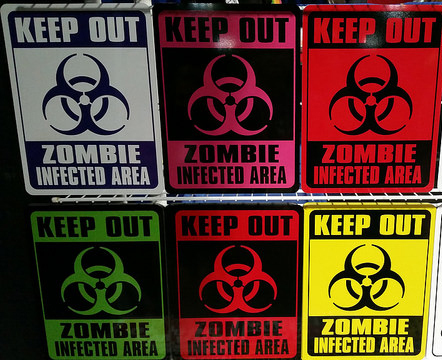 Photo Credit: Zombie Zone by Michel Curi on Flickr, used under a CC-BY 2.0 license.